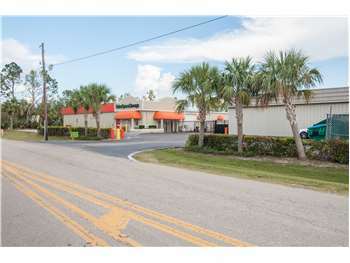 Naples Self Storage at 571 Airport Pulling Rd. N.
Located on Airport Pulling Rd. N. between Exchange Ave. and Prospect Ave., Extra Space Storage serves Naples residents near Leawood Lakes, East Naples, Royal Harbor, Bears Paw, and Central Naples. Locals will recognize our facility near Naples Municipal Airport next to Enterprise Rent-A-Car, Autohaus of Naples, CarMax, and Naples Acura. We're also accessible for residents of nearby apartments, such as River Reach, Goodlette Arms Apartments, Gordon River Apartments, George Washington Carver Apartments, Orchid Run Apartments, Meadow Lakes, Saxon Manor Isles, and Ospreys Landing Apartments. Extra Space Storage is about 1.6 miles from Naples Municipal Airport. Whether you're traveling out of the area or coming to Naples, we have a secure short-term or long-term storage solution for you. With a wide range of storage unit sizes and amenities like vehicle storage and climate control, Extra Space Storage on Airport Pulling Rd. N. is your ideal self storage partner in Naples! No matter what you plan to store, we have something that will fit your needs! Unit sizes at our Naples storage facility range from 24 square feet to 2,160 square feet. For your convenience, we have indoor access, first-floor access, drive-up access, climate control, and outdoor vehicle storage as well. Looking for a long-term storage solution for temperature-sensitive items? Climate control protects your belongings from extreme heat by maintaining an environment between 55?F and 85?F year-round. Climate-controlled storage units are available in sizes 4x8 to 20x36. Extra Space Storage in Naples offers 10x10 to 20x36 drive-up units and 12x15 to 12x30 outdoor parking spaces to accommodate your vehicle storage needs. With electronic gate access and 24-hour video surveillance, you can rest assured that you and your belongings are safe at our Airport Pulling Rd. N. storage facility. At Extra Space Storage, we understand the importance of secure, affordable, and reliable self storage. We've made it our mission to provide clean, well-maintained storage facilities managed by a team of friendly professionals who truly care for each and every customer. No matter where you are in your journey, Extra Space Storage can make your transition easier. Reserve a storage unit in Naples today! Very helpful and location & pricing promotion of storage site big factor in choosing this storage. Would highly recommend this facility to anyone looking for a storage unit. Place is clean,staff easy to work with and very professional. Awesome, Friendly, thorough, organized and Nice! We feel the customer service is phenomenal. They went out of their way to assist us in storing an Class A RV, which in central Naples is a challenge. They kept us informed of openings/cancellations. We had a smaller vehicle in a storage unit. I felt safe going in and out of that unit at all hours. Kudos to Lewis a real superstar. Best storage facility. Prices are great customer service in Phoenix was great and an now storing in Naples Fl. I have been using Extra Spave Storage for a few years now and have never had an issue. This is the first storage company I have used that has provided premium customer service. I feel the manager is a great person and truly cares to make sure that I am taken care of. He provides some of the best customer service I have ever received. Overall, Extra Space Storage is the place to go! Lewis and staff always go above and beyond. Locked myself out of my car and they provided shelter and hydration! They are always the best!!!! The staff was great, but I personally worked with Leo and he was extremely nice and very helpful and went out of his way to ensure I was happy with the rental and followed up with phone call when he said he would. Made payment 6/10/18 with confirmation has not yet posted...wtf Should have NEVER used you for a second time. You were a HASSLE before apparently things have not changed!!!! Once I get my possessions I will NEVER use your company again. Made a psyment with CONFIRMATION and you still haven't processed it!!!!! Office staff will help you with anything, very friendly and knowledgeable and the storage site is very well kept. You won't be sorry you rented from them. My husband and I have rented units from this location for 4 years. When Extra Space took over the facility, the level of customer service increased exponentially! The facility is kept spotlessly clean and Louis and Gina can always be counted on to address any concerns. They are kind, courteous, and efficient and help to make us feel like family. Always a wonderful experience!! Excellent location for storage in Naples, FL. Top notch, well-informed customer service on site. A better range of unit sizes than most locations (up to 40x12). It could not have been an easier or more pleasurable experience checking my car in for storage! Great storage quick and easy and for as long as you need. Knowledgeable and friendly staff to help with your storage needs. Try them. You’ll be happy you did! Needed to store several items while selling a condo in Naples, Florida. Googled storage in the area, called ExtraSpace Storage, was impressed with the phone support I got and also with the associate at ExtraSpace with whom I met. Very Happy! My experience was the best. The people at Extra Space storage were friendly and helpful in getting us situated in an appropriate storage space. Thanks for all your help! Great customer service! Staff more than willing to handle storage needs! Nice facilitie. Employees are great! Unit had some issues not noticable when I signed the contract - water on floor and the door is hard to open. Location is convenient and pricing was good. However your monthly rental rate increases over time. And that keeps me looking for better deals and moving my stuff around more often which is a hassle. Peter was great to deal with. A wonderful customer experience. Peter is upbeat , good-natured and doesn't get flustered. Peter knows how to treat a customer. Great place for storage. Great staff to help you with all your storage needs. Great location. Easy access. Inexpensive insurance available. Great access hours. My sister used ExtraSpace Storage in the past, she was extremely satisfied and therefore referred me there. Excellent customer service, both employees that helped me valued my business, I could clearly see that they enjoy their jobs. They also interacted with a few people who were ahead of me, everyone received the same distinguished customer service. Finally, it's a very convenient, easy to reach to and secured location! I have been with Extra Space Storage since 6/12/17,my initial impression has been favorable thus far.Hopefully this trend will continue as such. Have had to rent a unit from here for the last 4 yrs & ever since this company bought them out my rent goes up by $10 every few months & is getting to be too expensive for such a small unit. Don't do & find other another optioninless you like paying an arm & a leg. Great experience. Easy to deal with. Nice people and clean facility. Great pricing structure. Peter Jones at the Airport Pulling Road location in Naples is very helpful. Area is always clean and I feel very secure keeping my precious treasures in their storage facility! This facility is very clean and is conveniently accessible. Peter Jones was wonderful to work with and showed us two different units for overall size to be sure we got the unit we would need. Peter never pressured us and when we went back to rent the unit we had been shown, he was very gracious and easy to deal with throughout a rather lengthy signup process which he streamlined for efficiency. Great place! This time rented in Naples, FL. Have used this company in multiple states. Helpful rental agents on phone who identify your needs and quickly offer the appropriate space, possible locations, and best pricing. All locations have been clean, well lit, with good access. On site employees have always been knowledgeable and helpful. Have used other companies and am comfortable with this known quantity. This is probably one of the best managed facilities around. Great manager willing to help satisfy your needs in every way. Don't think you'll find better!! If you need a place to store and need any help in any way this is the place to go!! If you are coming south on Airport Pulling Road, stay on Airport-Pulling Rd toward I-75. Make a right on Exchange, there will be a Enterprise Car Rental/Acura Dealer on the corner, the Naples Airport is across the road on the left. We will be on the right side of the street on the back of the Enterprise building. If you are coming from the east, go west on Radio Road to Airport Pulling Road. Turn right and drive past Wells Fargo Bank up to Exchange. The Enterprise/Acura dealer will be on the corner. The Naples Airport is across the street. Turn Right on Exchange Ave. We are on the right side at the back of the building. If you are traveling West, follow Golden Gate Parkway to and turn right on Airport Pulling Road. You will pass Naples Golf Club and Bears Paw Country club. Keep straight about 1/4 mile until you see Enterprise/Acura dealer on the corner. Please make a left on Exchange Ave. We will be on the right side behind the Enterprise Car building.